Rep. Denise Dittrich (DFL-Champlin) spent years learning the complexities of public school funding as a teacher, parent volunteer, Anoka-Hennepin school board member and state representative. But until a legislative field trip to northern Minnesota in 2007, she’d never heard of the Permanent School Fund, a perpetual land trust for schools. What she discovered was as good as the lost ark sought by Indiana Jones — a boon for schools hidden in plain sight, right under the forest lands and open pit mine Dittrich toured. Set up in the state’s Enabling Act as an endowment for public schools, school lands are a legacy of the nation’s founders. Dittrich discovered three things: Minnesota’s trust lands are not being fully used to generate revenue for schools; that what revenue exists, mostly from timber harvesting, does not even reach school districts directly; and that one other state, Utah, is a model for reform. Utah’s 1994 reforms turned its school trust fund from a poorly managed, oft-raided “molehill” into a “gold mine” worth $1 billion, according to Margaret Bird, director of Utah’s Children’s Land Alliance Supporting Schools. Its proceeds go directly to schools, with local councils determining how the money will be spent, which is often for remediation, learning materials or technology. “It’s easy money, not from taxes, but from prudent and proper investment,” Bird told the House K-12 Education Finance Division March 16. In 2009, income from Minnesota’s fund was $27 million on its $614 million market value, according to Minnesota Management & Budget. As the fund corpus grows, so will return on investment; that isn’t the problem. Instead it’s the state’s laissez-faire attitude toward managing the lands and monitoring cash flow, which Dittrich says shortchanges schools. Managing trust lands falls to the Department of Natural Resources, recently criticized by the Office of the Legislative Auditor for lack of management planning and lack of adequate resources. The DNR charges fees for forest management and administration fees to the trust, as permitted by law, but Dittrich and others say the school trust income has been subsidizing some of the DNR’s work. Wayne Brandt, executive vice president of Minnesota Forest Industries, said “tight budget times” have created “a strong incentive to load costs against the trust.” For example, he told the House State and Local Government Operations Reform, Technology and Elections Committee March 1, the school trust is the only government entity in the state that’s charged for fire suppression. According to Bob Meier, DNR assistant commissioner, the department fees for trust land management and administration nearly doubled between 2004 and 2009, from $5.98 million to $11.18 million. In 2009, timber sales receipts were about $9 million, and gross revenue from minerals activities was $16.7 million, mainly from iron ore/taconite rents and royalties. Just $200,000 of forestry income was actually deposited into the fund’s corpus that year, Dittrich said. Minerals revenue over $3 million is automatically deposited into a minerals suspense account. Determined to create a “new paradigm” along Utah’s model, Dittrich is focused on restoring Minnesota’s fund to its original purpose and potential. She sponsors a slew of reform bills she hopes will change the way people think about the fund and how it’s managed. One is HF3475, which would establish a quasi-independent state agency, like Utah’s Land Trust Administration, to oversee the management of school lands. Bird said the Utah agency upholds one principal value: “a duty of undivided loyalty” to maximize short-term gains for schools while retaining long-term land preservation for future beneficiaries. Utah has strategically swapped, sold and bought lands to benefit its school trust. In one case, it made school lands available to relocate a colony of endangered prairie dogs that was impeding commercial real estate development elsewhere — earning $2,000 per critter. More commonly, it generates around $150 million in school revenue annually from land sales and leases for a variety of uses including oil and gas, wind power, geothermal fields, telecommunication sites, grazing and farming. Local environmentalists remain wary that school trust lands could be overdeveloped without a vision of conservation. Steve Chaplin, senior conservation scientist with the Nature Conservancy, told the state and local government committee he is concerned, for example, about 17,300 acres of old growth forests on school trust lands, whose value is “much more significant now than when the lands were originally set aside” because of their scarcity. Dittrich said there’s a difference between public lands and school trust lands, and that the constitution and state law mandate balancing both the preservation and the use of school trust lands. She said the DNR’s mission of conservation and preservation inherently conflicts with the trust’s purpose of development and land use to generate revenue. “This isn’t a witch hunt. This is really trying to get to the right solution,” she said. Rep. Pat Garofalo (R-Farmington) supports enhancing accountability for the fund to get maximum benefit for students, “if we can do it without growing government, by redirecting existing resources.” He said the bill is silent on that. The bill awaits action by the House Rules and Legislative Administration Committee. Sen. Chuck Wiger (DFL-Maplewood) sponsors a companion, SF3042, which awaits action by the Senate Environment and Natural Resources Committee. 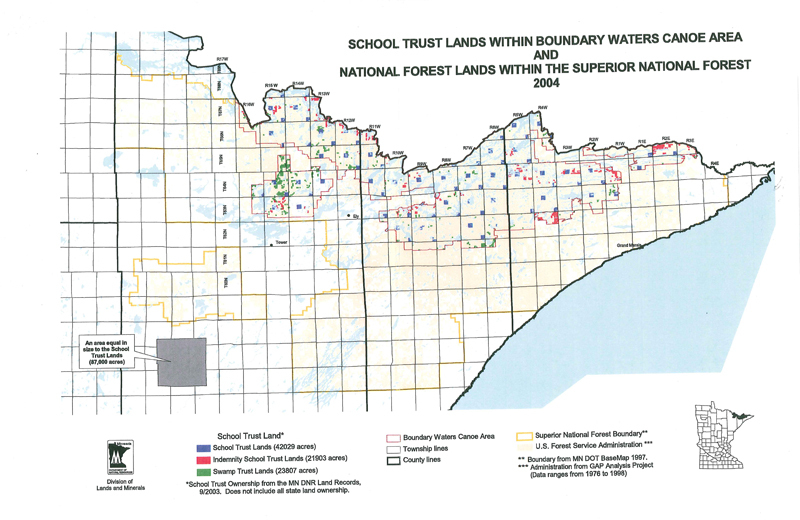 Garofalo has signed on to HF3084/ SF2494*, sponsored by Dittrich and Sen. Tom Saxhaug (DFL-Grand Rapids), a resolution to Congress approving negotiations to swap and sell 86,000 acres of school trust lands within the Boundary Waters Canoe Area to the United States Forest Service. The exchange, said Dittrich, would be worth between $60 million and $80 million that would be added to the school trust corpus, or principal, while the lands would be preserved as wilderness. The Senate passed the bill 62-0 March 15. The House passed it 113-0 March 25. It now goes to the governor. A 2008 law Dittrich sponsored has already begun to put revenue from the fund back into school districts’ pockets. It directed that investment income from the fund be paid directly to school districts, instead of reducing general education fund payments to districts, which has been the practice since at least 1971, according to Tom Melcher, Education Department program finance director, and possibly since the late 1950s. “This year, the only new revenue to our schools was school trust land money,” Dittrich said, in the amount of $28 per pupil. For Patty Phillips, superintendent of North St. Paul-Maplewood-Oakdale schools, that means about $308,000 of new money. District leaders haven’t decided yet how to spend it. “Where do we begin?” said Phillips who is a member of the Permanent School Fund Advisory Committee and went on the 2007 trip. “We have a $7 million deficit between expenditures and revenue so we will put it to good use. At Issue: Whose values are they anyway? Performance measure has perks, but is it affordable?